This afternoon I caught a bus to the edge of town, to a parking lot where tourists pay big bucks to ride the Christchurch Gondola to the top of the Port Hills ridge (then ride back down again). It’s like a ski lift, minus the snow – and the skiing. From there, a modern (dark, choking) tunnel now cuts straight through the stone, and spits vehicles out at the Harbor of Lyttleton. Instead of the tunnel, I hiked the Bridal Path Trail, which cuts up the hills through stark, lichen-covered ridges of weathered rock. This is the original route used by pioneers to New Zealand in the 1800’s — they got off the ships in Lyttleton and carried all their possessions on their backs over the hills, then hired wagons into Christchurch. The hiking path is steep, not an easy hike. There are benches for breathers, some of which are dedicated to the historic ships — Cressy, Raymond — on which the pioneer families arrived. It was a terrific way to stretch the legs. Lyttleton is more recently famous as a port supporting historic expeditions to Antarctica — both Scott and Shackleton used Lyttleton to repair and re-outfit their expeditions before they left for the Ice. Modern expeditions to Antarctica continue this tradition. I can’t tell you how excited I was to see that the NATHANIEL B. PALMER is currently in port at Lyttleton! This is the vessel that my friend Stuart Klipper sailed on, during one of his Antarctic Artists & Writers stints — taking fantastic photographs of icebergs, penguins, and brooding, brilliant seascapes. After hiking to the far end of Lyttleton, where the historic tower of the TIMEBALL still stands, I stopped for a beer in downtown, at a pub with a great deck view. Ran into some older fellows who apparently know the new captain — the NBP is going to set sail on Saturday, they said, and the captain will be in the pub for a drink tomorrow night. 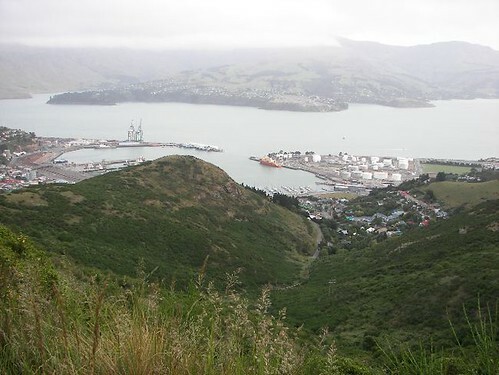 I made reservations at a backpacker’s joint down the street, then I hiked back across the Port Hills, to Christchurch. Behind me now, in the lounge of the Windsor B&B, there are folks discussing today’s flight to McMurdo — they got halfway to Antarctica, then flew back, ran low on gas, stopped in Dunedin for more fuel, then returned to Christchurch. Sigh. They are set to try the same flight again tomorrow! Ugh. This is what ice-bound travelers call a “boomerang” flight.